Expect me, n—a, like you expect Jesus to come back / Expect me … I’m coming. The mood and scene were one and the same out in that empty Southern California field. Dark and ominous. A wind blew furiously as night fell. Time was running out. With just four days until the start of the 2012 Coachella Valley Music and Arts Festival, there was no room for any more mistakes. Hip-hop impresario Andre “Dr. Dre” Young had a specific vision for his headlining performance with Snoop Dogg. But the miscues were relentless: unanticipated flashes, rendering errors, plain old glitches, you name it. Nothing seemed to go right during rehearsal as Dr. Dre looked on with Eminem, who was a scheduled special guest for the show. The hood of Marshall Mathers’ jacket draped over his head as he watched in silence. Oh, my God. We’re going to fail. That’s what Janelle Croshaw, visual effects supervisor of Academy Award-winning studio Digital Domain, said she thought to herself in the moment. For six weeks, Croshaw, along with fellow supervisor Steve Preeg and their team, had worked tirelessly to make what seemed psychologically, and spiritually, unfathomable: They had to recreate Tupac Amaru Shakur. And they did. Fifteen years, seven weeks and three days after he was pronounced dead as a result of internal bleeding from five gunshot wounds he sustained in a Las Vegas drive-by, Tupac performed again. It was April 15, 2012. During Dr. Dre and Snoop’s set, a shirtless figure emerged, with a “THUG LIFE” tattoo on his stomach, pinky rings on his hands, pants sagging and Timberlands on his feet. It was the perfect surprise for the final act of the night on the main stage — Dr. Dre and Snoop having already floated through nearly 20 tracks, though no moment would compare to what came next. A computer-generated Tupac made this proclamation to the crowd of 80,000. It raised his arms to roars before he began to perform his posthumous 1998 single “Hail Mary” and 1996 hit collaboration with Snoop, “2 Of Amerikaz Most Wanted.” On this night, the “Tupac Hologram,” what many still call the virtual being, was born. 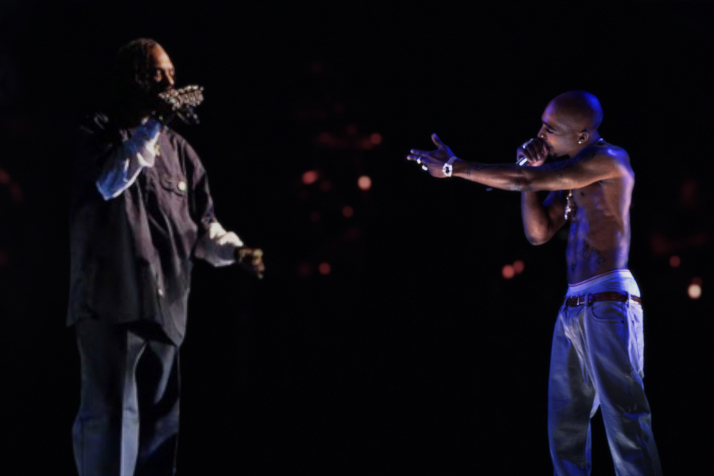 A holographic image of Tupac Shakur is seen performing with Snoop Dogg during day 3 of the 2012 Coachella Valley Music & Arts Festival at the Empire Polo Field on April 15, 2012 in Indio, California. Technically? It wasn’t a hologram — which is defined as a light-beam-produced, three-dimensional image visible to the naked eye — but rather a two-dimensional projection that employed a theatrical technique first outlined more than 430 years ago. Tupac made it to that stage because Andre “Dr. Dre” Young made sure of it. 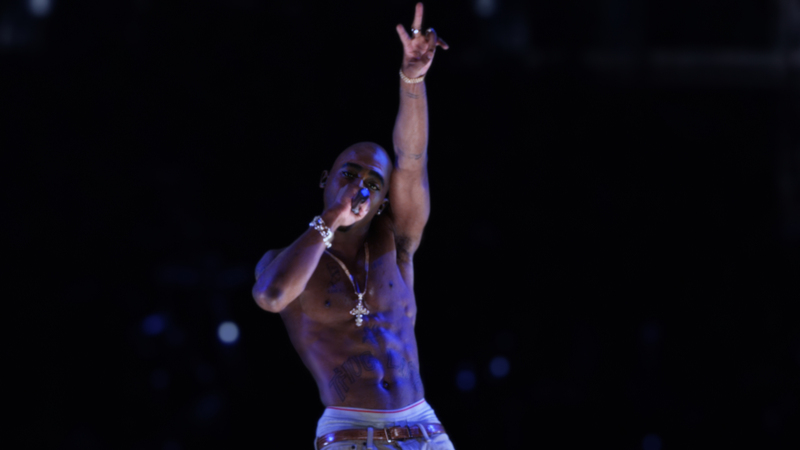 There was something authentic and visceral about the projection of Tupac that Coachella attendees experienced. The Hall of Fame musical artist died at the age of 25, three years before Coachella debuted in 1999. But Tupac made it to that stage, because Dr. Dre made sure of it. The technique is called “Pepper’s Ghost,” named after 19th-century British scientist John Henry Pepper, who adapted the method in 1862. The theater trick involves the projection of an image onto an angled piece of glass, which is reflected back onto the stage, providing the audience with the illusion of a ghostly presence. Tupac would have appreciated Porta’s work, given his affinity for Italian Renaissance literature during his nine-month prison sentence on sexual assault charges in 1995 (he denied the charges ever after). Most notably, he took a deep dive into Niccolo Machiavelli’s 1532 political treatise The Prince, finding solace in the words of the 16th-century Italian philosopher and political theorist, who in his work presented the idea of feigning death to exploit one’s enemies. After his release from prison, ’Pac changed his stage name to “Makaveli,” and the final studio album he recorded before he was killed, The Don Killuminati: The 7 Day Theory, was inspired by the legend that Machiavelli faked his death before reappearing seven days later to seek revenge upon his enemies. Tupac’s fascination, or borderline obsession, with Machiavelli in the final few years of his life remains at the heart of the rabbit-hole conspiracy theories surrounding what many still believe to be true: Tupac Shakur faked his death and is still alive. And so in 2012, when Coachella had two of Tupac’s former Death Row Records labelmates in mind for the festival’s lineup, Dr. Dre toyed with this concept of ’Pac’s legend. Dr. Dre and his production team were responsible for working with Tupac’s estate and handling the legal ramifications of using his likeness, which required the approval and blessing of his mother, Afeni Shakur (who died in 2016, four years after the Coachella performance). Smith and AV Concepts were responsible for bringing the projection technology to the United States. In place of the technique’s traditional use of glass, AV Concepts would use Mylar foil. And instead of a straightforward projected image, a bespoke computer-generated Tupac was envisioned for the performance. That’s where Digital Domain came in. The studio’s work on films such as X-Men: Days of Future Past, TRON: Legacy and 2008’s The Curious Case of Benjamin Button, which won an Academy Award for best visual effects, all caught Dr. Dre’s attention. While working on a project in New York, Croshaw received a call regarding the assignment and rushed back to Los Angeles to start working. It was mid-February, and Digital Domain had to have virtual Tupac ready for an April 15 curtain call. Croshaw and Preeg established a team of 20 — small for a project like this, she said. Their skills spanned every digital effects department imaginable. There were rotoscoping and paint teams to warp and pull the design to make it look like Tupac’s body. There was someone in charge of lighting. There was a technician who figured out ways to automate certain tasks in composite work, which Croshaw headed. Preeg served as an animation director, heavily involved in the rigging of Tupac’s skeleton. Under him were two animators: one handling the animation for “Hail Mary” and the other for “2 of Amerikaz Most Wanted.” And, last but certainly not least, there was a sculptor who worked down to the 11th hour to make sure Tupac’s face and mouth shapes illustrated his likenesses to a T.
A holographic image of Tupac Shakur is seen performing during day 3 of the 2012 Coachella Valley Music & Arts Festival at the Empire Polo Field on April 15, 2012 in Indio, California. They had to make their version of Tupac essentially from scratch. “Because he passed away in the late ’90s, it’s not like these days where a lot of actors have scans done of them. … With Tupac, we didn’t have anything.” They ended up using footage of Tupac’s final live performance from July 4, 1996, at the House of Blues in Los Angeles, which was released on DVD in 2005. The last song ’Pac performs on the tape is “2 of Amerikaz Most Wanted.” So for one of the songs on virtual Tupac’s Coachella set list, there was a point of reference. For the other? Tupac never performed “Hail Mary,” which was released on The 7 Day Theory nearly two months after his death. Digital Domain possessed no footage to match to but had leeway in crafting his movements. Croshaw, who recalled the creation of Coachella’s digital Tupac via the phone while on maternity leave, didn’t sugarcoat the process. Creating a virtual human being is scary, she said, especially in the initial stages of the design. There was a moment early on when Dr. Dre got a glimpse of Tupac’s face — outside of old photographs and video clips — for the first time in years. The week of Coachella 2012, Croshaw began making daily 2 1/2-hour drives from Los Angeles to the festival site at the Empire Polo Club in Indio, California. She was hand-delivering hard drives containing 16,000 or so frames that would come together to form the digital being of one of the greatest rappers of all time. Yet the California desert wasn’t quite welcoming the virtual return of Makaveli. Sunday, the point of no return, finally arrived. At the end of the night, Dr. Dre and Snoop took to the stage. When it was time, AV Concepts crew members had about 90 seconds to calibrate their screen in the wind before all systems were a go. In a matter of moments, Tupac Shakur rose from the floor of the stage and greeted his Death Row brethren. The drop of “Hail Mary” cut him off before the eerily real digital figure bounced and swayed to the beat, dancing his way over to Snoop to perform “2 of Amerikaz Most Wanted” in perfect cadence — like they were at the House of Blues and it was 1996. 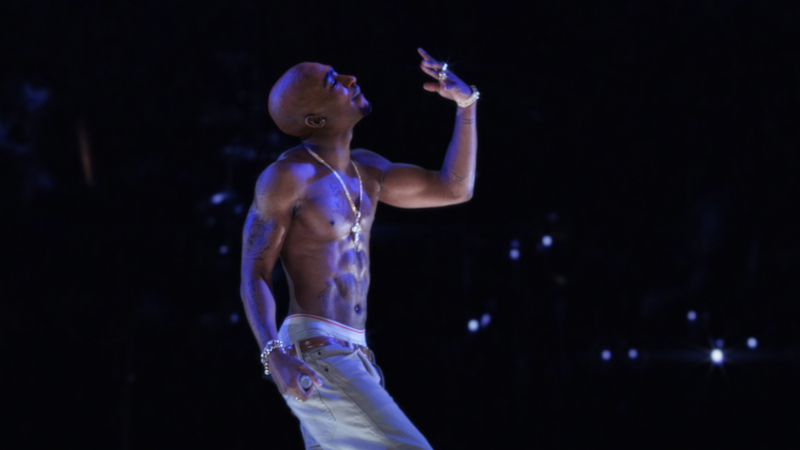 The performance, which was livestreamed worldwide on YouTube, ended with the virtual Makaveli returning to center stage, bowing his head and then disappearing in a burst of fragments. Croshaw remembers dead silence from the crowd, before a heartbeat appeared on the LED screens flanking the stage and Eminem came out to the sounds of cheers. If creating a virtual human being is scary, watching one is, as well. 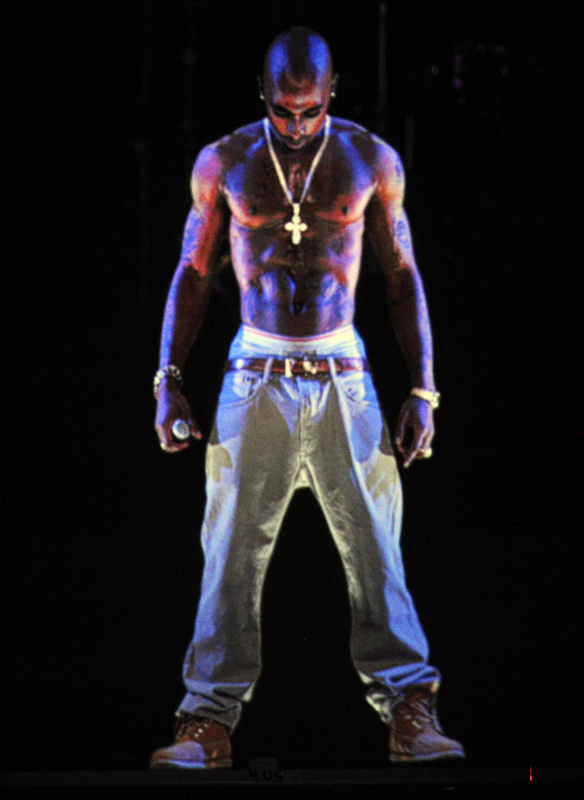 Upon seeing the “Tupac Hologram” (which went on to win Digital Domain the prestigious Cannes Lions Titanium Award in June 2012, for the most groundbreaking work in the creative communications field), many people didn’t know what to make of it. “That Pac Hologram haunted me in my sleep,” musician and author Questlove tweeted. UPROXX Editor-in-Chief Brett Michael Dykes reached out to his friend, who saw the performance live. “I thought I was seeing things. One of my friends who was really high got really upset that 2Pac was dead and why are we doing this. A few were confused and thought he might be alive now. I knew it was a hologram right off the bat but then it looked so real …, ” she responded. Billboard music editor Jason Lipshutz even penned a column, titled “The Problem with the Tupac Hologram,” that summed up his thoughts in a question he poses at the end of the piece: “Why do we need to watch an imitation of Tupac when we have an incomparable plethora of his own art at our disposal?” And, of course, former Death Row CEO Suge Knight had something to say, citing one fundamental problem with the recreation of Tupac’s being: “At the end of the day, how you gonna take the Death Row chain off Pac?” Tupac’s hologram wore a gold cross chain. The debut performance sparked rumblings that Dr. Dre would be taking ’Pac on tour with him after the festival. But rumors were quickly squashed by the man himself. “It was strictly for Coachella — get it right,” Dr. Dre said in a video message to fans before taking the stage during the second weekend of the festival. On that night, April 22, 2012, Dr. Dre and Snoop shared a stage with their virtual homie one more time. And, per Dr. Dre’s words, don’t expect them to do so again anytime soon. Tupac Shakur is dead. He’s not in Cuba, or working as a cashier at a Cluck-U Chicken on the campus of the University of Maryland. He was killed in 1996, and despite his bold lyrical professions, the closest he ever came to making a return to this earth was five years ago in digital form on the Coachella stage. And if you’re looking for the hologram, you won’t find it at Digital Domain or AV Concepts. The digital asset that Digital Domain created has been archived. Only Tupac’s estate has access.